Alumni attending the closing ceremony look through photo album. 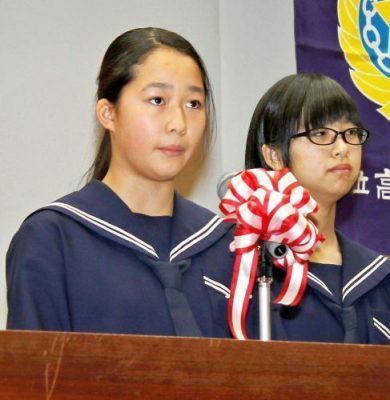 During the ceremony, two grade eight students, Ishihara and Morioka gave a speech as student representatives and shared their memories at the school. Second year students Ishihara and Morioka give a speech as student representatives. 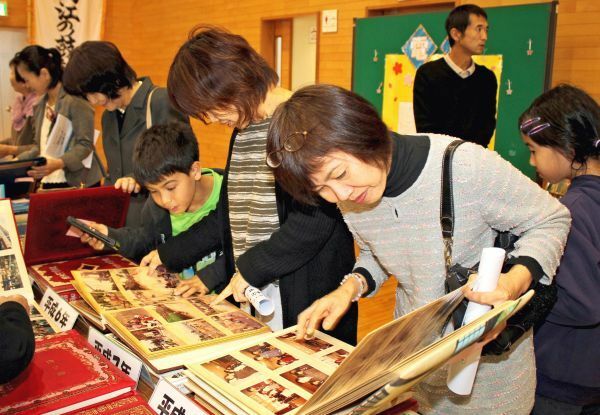 There was also an appreciation party held after the closing ceremony, and school children and local residents entertained gathered people with performances like Kagiyade-fu dance and eisa. Takae Jr. High was established in 1948. The number of enrolled students started to decline after Okinawa’s reversion to Japan in 1972, and there is only three students currently enrolled. 284 students have graduated from the school since its establishment.